I currently use The Tournament Director for the main games http://www.thetournamentdirector.net/ It is a fantastic piece of kit developed by one man, and has excellent support and user forums, it is fully customisable with your own screens and pretty cheap also! (I can also provide you with Sound/Event files etc to get you started right into show off level! It is widely used across the World and definitely one of the front runners outside Card-rooms but is used commercially in smaller card rooms. I also use for side games/ after games a simple clock which does not require any amount of setup to run called That Poker Clock http://www.thatpokerclock.com/ which is free and a simple set-up for sidegames. I know there is two big names used by US Card Rooms one is called genesis gaming, maybe a US member can give you more detail on them. What type of software are you looking? Tournament Clock only or Player Tracking and Registry? Many major card rooms now use the genesis gaming "Bravo" system. It's a very good system and is used at many Harrah's and MGM properties among others. Like any program it has pros and cons. The software while very technically sound is not very user friendly. It is prohibitively expensive and as far as I know is only available on a lease only basis. There a many many many tournament clocks if you just do a quick search. That Poker Clock - Very limited by stylish clock. You can add/delete blind levels and change languages and background themes, but that is all. No players. No Prize Pool. No Payouts. 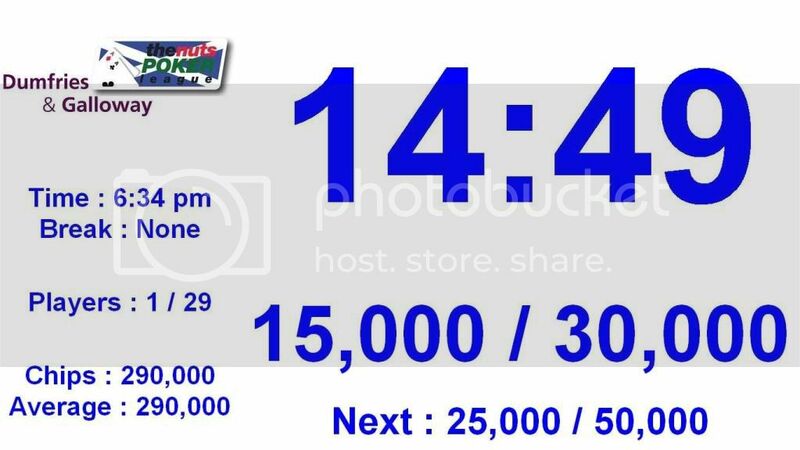 EuroPoker.com Tournament Clock - This clock is a bit more useful. You can add/delete blind levels. Create a Prize Pool with Number of Entries and Players remaining, including payouts by percentage. Very stylish design and is also listed now as Hollywood Poker Clock. What's the draw back? Unfortunately the inner clock workings take 1.08 seconds for every 1 second elapsed in real time. Therefore, you lose 10 seconds for every 2 minutes of play, making the each level last that much longer. The Tournament Directors Clock - Illustrated by Stuart. The Clock - Which you already have and is still used by smaller tournament stops. The Simple Tournament Director - Has some very nice features as well. But is often down because the programmer has server issues. But a offline version may be downloaded. You need Java to run. The Poker-Clock - Is another one that is able to run either on your desktop or straight from the web. Have been unable to go thru the pros and cons. PokerHost Pro - Never tried. Poker Tournament Manger - yet another clock. Mostly usable for home tourney's or small rooms with 50 players or less. Has the ability to do minimal player tracking and seating. Whether you host Texas Hold ‘Em events on the private, amateur, or professional level, ProDealer Buttons™ will elevate your game to a whole new level of control and strategic play. Now, instead of guessing at the time remaining or keeping track of blinds and antes, the ProDealer System manages time, amounts, and rounds with complete precision, allowing you to remain undistracted, and focused on your winning strategy. * Green lights mean the round is in normal play. * Yellow lights mean that the round is counting down and the blinds and/or ante will increase. This countdown timeframe can be easily configured for each game, or tournament. * Red lights signify that the round is over. More than just a timer, the ProDealer Buttons™ System also makes it possible to completely synchronize the action on any number of tables within a maximum of 900-foot radius—whether the play lasts minutes, hours, or even days. The system consists of a Dealer Button that can be used solo for single table play or synchronized with one or more Big Blind Buttons and Small Blind Buttons for single-table play. ProDealer Buttons™ Systems can be synchronized to control multi-table play. The Dealer Button controls the action, transmitting information wirelessly to the Blind Buttons, and synchronizing the Blind Buttons to itself and to each other. The Dealer Button can also synchronize an unlimited number of ProDealer Buttons™ Systems across many tables within the 900-foot maximum radius and, depending on the game template used. It can be operated manually from round to round or manually on selected rounds or set to run automatically, from first card to final bet, with a single push of a button! It can also be paused in any mode with a single click. In addition to the colored lights that signal the round’s progress, the Dealer Button displays the Time Remaining In The Round, Ante Amount (if used for the event), and BIG/SMALL Blind Amounts (if used). He asked what SOFTWARE was used not for a dealer button with a clock. I use SimpleTourneyManager . It is an inexpensive alternative for small tournaments, but still feature rich. Also, the owner and programmer of the software is very responsive to suggestions or bug reports. The only negative is that it requires Microsoft Excel to run. You are right, he did ask what software. The Prodealer Button is replacing software solution. This way everyone can see what your blinds are and what time is left. Plus if you are really wanting a software solution that runs on a laptop, we can integrate in to any software solution as well. Although we don't run cash games, we do run numerous tournaments with up to 130 players a night and we use Poker Tournament Supervisor, which is low cost and very functional. There is continuous development being done on the software, but there are one or two glitches you should be aware of before using it to run your own tournament. 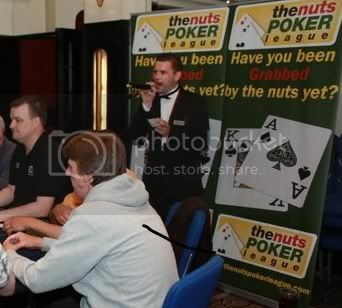 It is available for about $20 per license at www.pokertournamentsupervisor.com. The only glitch I have found is the ability to add players once the tournament has started. We have run tournaments of up to 150 players with this software and it is flexible in figuring the payout structure, assigning tables and seats, randomizing, etc. I didn't talk about PokerTournamentSupervisor, since we used this new software for the France Poker Tour, but with a special version for us : there was no player assignement, only a number of players to decrease by pressing a key. The developper is very nice and listen to the directors needs to improve his software. A great software to be, with a nice look. I am looking for a Tournament Registration Software but not Tournament Clock !!!. I am runnung offline tournaments about 150 player. I think Microsoft Access would be your solution then? But now I'm really curious! Why would you not want the tournament software fully inclusive with player management, seating and clock all together? Whether Access (database software) is your best choice depends upon what you want/need to do. If all you want to do is keep a record of player names, date of registration, amount paid and date paid, etc. Access may be more work than it is worth. You might be better off with a simple spreadsheet such as Excel. That said, you can also use one of any number of freeware products for either the database or spreadsheet. Personally, I like OpenOffice.org. Before anyone can give you a really intelligent answer, we need more information from you. Stuarts question about integration is certainly to the point. Old thread, but I'll throw my hat in the ring since I didn't see it mentioned above. We are new in Texas Holdem in our casino and for some reason the management bought Drneau software. I tested a few times and it seems to be OK but we did not organized real tournaments yet. Are there any problems with this software? I developed my own software and I already use it for my tournaments: The Treek's Poker Tournament Director.